This brief article, Pierre Bourdieu, Tim Geithner, and Cultural Capital, is well worth a read. It is precisely the same sort of social concentration in the mainstream new music world which concerns me; the fact that the kinds of composers who are invited to the Cabrillo Festival these days, for example, overlaps so much with those who study at, say, Juilliard or already get play in the major orchestra circuit probably also means that the range of ideas exchanged is necessarily going to be limited, and that kind of limitation does not readily lend itself to the outside-the-box thinking that can often lead to the musically exciting. This music is for whistlers, or very high treble instruments from any musical tradition (either/or, I think, but maybe one or two whistlers could be in a qroup of instrumentalists, but not vice-versa) . Winds or whistlers need to produce a steady tone of at least 20 seconds' duration. Time is to be indicated by the sound of antique cymbals at intervals as will be specified below. No sounds may be produced or amplified by means of electronics. The performance will last at least six minutes, or longer, if the performers agree on a duration; the composer thinks the best result will probably ensue if the tone-rest sequence is performed at least a dozen times, and perhaps not more than about twenty, though a still longer performance could be done. At the first sounded note, the piece will begin. The antique cymbals, as a sort of marker, will be struck three times, at well spaced intervals, and then twice in close succession at the end — five seconds or so apart. On hearing this signal, the performers will finish the tones, one by one, that they may be sounding, and when the last tone falls silent, the performance ends. Listeners: what you will hear is what you get. (cc) Part of the Public Domain, 2006. Very often, the comments to blog posts are where the really interesting activity happens but, hidden away behind an additional click in the archives, they often turn into lost bloggage. I think this thread on the complexity wars at Tim Rutherford-Johnson's The Rambler is well worth revisiting. There is a lot of red meat here from every side of the issues, and I think the dialogue between experimentalists and complexists has more common ground and is much more fruitful than that with the quietists who control much of the musical status quo. Both of our parties are uncomfortable with music, as it is, and are willing to rock the boat so that it, and life around music, might be something different. I probably should have pushed one of my points in this thread more: not only is Drumming damn hard to play and an authentically complex musical experience for the listener, part of the difficulty and, yeah, complexity of Drumming lies in the fact that the accuracy of the players is verifiable — by player and listener alike — to a degree both unimaginable and irrelevant to, say, Bone Alphabet. Consequently, this leaves the player in an exposed position with precious little room to fake her way through it. The one disappointing aspect of the thread is that it ends with the almost inevitable one-upmanship that characterizes a lot of the macho talk which prevails in the complexity scene: "name the time and place, Buster, and I'll play you a 13-against-7"; I personally prefer the attitude, found more often in the radical music community, in which greater performative or perceptual accuity is most immediately and optimistically adressed as a compositional problem, that is to say, making a music that more clearly makes the nature of its material articulate for the listener seems to be about inviting the listener to hear more rather than less and not simply witness virtuosity for its own sake. Edward Lawes points to this rather nice video of composer Brian Ferneyhough rehearsing his Bone Alphabet for solo percussion. It's a great little piece and the film is a good document of Ferneyhough's amiably non-dogmatic approach to working with good players. Just one little complaint: Ferneyhough insists on describing non-power of two rhythmic relationships as "irrational", a habit that's frequent among the complexity set. 3:2, 4:3, 11:7, 17:13.... as complex as they might be when used to articulate a rhythmic relationship, these ratios of whole numbers are all, by definition, rational, nor irrational. Boy, was I disappointed to learn that the Imagem Music Group had acquired the Rodgers & Hammerstein catalog! If I had known that they were in the market for a corpus of music like that in the R & H musicals, then my partners in the Music Division of Wolf Industries of Gulfport, Miss. would have been more than happy to make an offer. Thanks to a series of proprietary algorithms developed by our staff of highly-paid, well-trained, fine-mannered, and not t00-tough-on-the-eyes music industry scientists and technicians, we have the capacity to rapidly deliver single works of music or works for the musical stage and screen on demand equivalent to any known work, but different enough from said works to guarantee adequate distinction in the case of any copyright infringement action via sophisticated music-theoretical procedures including parody, transposition, inversion, retrograde, and a complex operation involving moving a lot of notes around on the page that we like to describe as variation. There is a central paradox in Young's composition and performance practice that gives the music a large part of its highly individual character and charge. Although his earliest mature compositions were frequently without a global tonal center (a number of the early pieces are twelve-tone, but the slow tempo often strongly invites a localized sense of tonality), his subsequent concern for precision in the domain of pitch has continuously increased, and with it, he has progressed up into unexplored regions of the harmonic series, reinforcing a form, if highly expanded, of tonal centeredness. However, in his rhythmic practice, the actual articulation of those pitches in musical time, remains free, from regular metre and, often, from even a steady pulse. 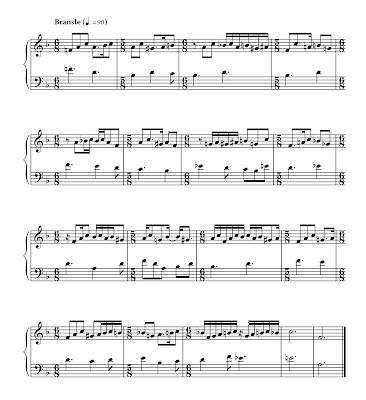 The Well-Tuned Piano, for example, alternates in texture between a free articulation of the simplest pitch configurations, both melodically and in simple harmonies, dyads or triads, in a manner suggestive in speed and mood of an alap, an unmeasured prelude, or a very deliberate recitative, and "clouds", which are larger pitch collections, frequently at or past the boundary between a chord and a fused sonority of timbral rather than chordal complexity, articulated by a continuously developing motion of the hands and individual fingers, keys, hammers, and wires, intuitively adjusting the speed and patterns in order to lock into textures in which the entire acoustical complex is self-reinforcing, bringing out internal melodic and harmonic patterns as well as phenomena — beating and combination tones especially — which create a whole larger than the sum of the component parts. The sources of Young's style are a heterodox assembly of consequences and influences that happen to have reinforced themselves particularly well. Young's own study and practice of forms of Bebop and free jazz as well as an alap-heavy style of North Indian Classical vocal music both landed the composer-performer in ametrical territory (not to mention the important experience of musical traditions with their own solutions to the real time articulation and ornamentation of static pitch configurations), and while Young has always been a man with the tempo of a tortoise in the exercise of everyday life and he grew up in a household and church in which talk of both "all time" and "eternity" was everyday chatter, the pursuit of ever-greater accuracy in intonation, requiring an ever-longer sampling period and Young's attachment to electronic tone generation, with its potential for both more accuracy and more continuous playing durations, have only increased the openness of his rhythmic and, indeed, formal sensibility, while altering none of the rigor of his pitch selection. Let's get over the Steve-Reich's-Pulitzer-Is-Well-Deserved-But-30-Years-Too-Late trope, okay? If you go through a list of the music composition awards* (or the poetry or editorial cartooning awards, for that matter), it's pretty clear that they stick to a pattern of handing it out for several years in a row to mid-career musical quietists (mainstream conservatives, and yes, I mean quietist, even when the music is loud) and then tossing in a neglected senior figure from time to time, either someone really unavoidably significant, but never within the acceptable middleroad (Ives, Brant, Coleman) or someone very much a part of the establishment but not actually having produced a great piece (Sessions, Powell, Gould). Ron Silliman, from whom I cheerfully steal the E.A. Poe term "quietist", has a great post this week (here), in which he notes that in US poetry, it has only been new formalists who have made an attempt at stealing the brass ring from the quietists. East coast 12-toners seem to have once made a serious attempt along these lines in the Music Pulitzer's, with Wuorinen and Martino each getting through, as place holders, perhaps, for Babbitt, who was eventually settled with an honorary "lifetime" award, but the awards themselves quickly returned to the routine of less obstreperous selections. While it may well be possible that Ben Johnston, for example, a figure who has does some bridging between the experimental and academic worlds might yet see an award, and an award for Glass is probably only a matter of time, major American composers — all composers, in fact, whose work is understood now, in terms of concert performances and recordings, to be essential American repertoire — for whom the ring was simply never available have included Harrison, Cage, Feldman, Brown, Nancarrow, and Erickson and probably will continue to include Riley, Young, Lucier, Ashley, Oliveros. The bigger story about the Pulitzers is, of course, the continued slighting of online journalism. I suspect, for better or worse, that the first such award will come in criticism, given the continuing reductions in critic positions by print journals. Fortunately, there are some blogging critics out there who have already demonstrated the perceptiveness and writing chops required as well as a command of the medium's unique possibilities to do the job imaginatively. Jessica Duchen is on the trail of the (corrupt) music competition system. The career stakes for performers in these affairs are generally higher than those for composers, for whom the main problem is that entrants are too often being asked to fund the competition prize through entry fees without clear-cut aesthetic criteria for the judging offered up-front, but the nepotism and abuses of the jury system indicated here are alarming. Music is not a sport and simply doesn't operate by the kinds of rules that lend themselves to fair judging, so maybe the best solution is to simply recognize that competitions — unless very carefully, ethically, and openly organized, like the "Iron Composer" competition, for one — are by nature prone to abuse. Given that recognition, we can then either ignore them altogether or take them in a much lighter spirit, as a none-too-serious form of entertainment. The best way for a young musician to establish a reputation for playing is through playing, especially with other musicians, not competing against them. Play lots of different music in informal settings, as a soloist or chamber musician, and cultivate your "works well with other skills" as well as the purely musical chops. Playing for free in such events is far more useful than trying to finance your way into the competition circuit. Organize your own soirees and concerts. The finest musicians I know have established careers in just this way and their independence from the conservatory/competition/agent system has meant that they can play a greater number of concerts with a greater variety of music and have more interpretive freedom than their colleagues who are locked into narrower repertoires with lower levels of interpretive tolerance. The per-concert fee of a good new music pianist, for example, may be lower than that of a good Chopin player, but the new music pianist is going to play more music more often and can more readily establish a niche that looks like a real career than the mainstream player who is always subject to the whims of the current market. Like most American males, I learned to dress at the age of 12 and have learned nothing more about it since. My own sartorial preferences have remained in that age, when the two principal models were that pair of boys' lit Toms, Sawyer and Brown. In Grad school, the choreographer and scholar Susan Foster encouraged me to read Roland Barthes; while I really liked Empire of Signs (the book about a country very much like Japan) , The Fashion System was totally lost on me, and I've never been quite sure whether my deficit was due to intellectual weakness on my part, or just an ordinary heterosexual allergy to fashion. Nevertheless, I have recently made some modest efforts to up my wardrobe, but the direction is more retrograde than original. I'm back to wearing hats, but now going with wide brims rather than the caps of my schooldays and in Kathmandu, perhaps risking the dismay of some vegetarian friends, I had a couple of extra-long leather ties and a suede vest made for me, figuring that both were about a generation out of style, so there was a chance to beat the curve for once. Moreover, having not worn a tie for about five years (and that last one was a bolo at that), maybe it was time to at least imitate the appaearance of a grownup. Which brings me to my (small) musical point. Many of my recent pieces have been coming out with surfaces that recall familiar musics enough to be heard as, well, neo-classical. Inasmuch as my current working mode has emphasized, instead of first principles, digging into historical repertoire and locating alternative paths not taken, the label certainly fits. But only if the "classical" part is loosened up a bit more (neo-subitor, neo-serial, neo-experimental...). In any case, there is certainly nothing less fashionable at the moment than to assert a relationship to the classical, even when neo- or pseudo- or quasi- or just plain faux-. And the musical point of this is that one only moves forward, does or makes or discovers something really new, when one is out of step with fashion. When the world zigs, kiddos, it's time to zag. Noted: the average DVD shop in Kathmandu has a better selection of classic art films than the average shop in LA. You can walk out of one of those places with the complete works of Bresson, Ozu, Antonioni, Griffiths, Renoir, Buñuel... I know that these are all copies of dubious legality made locally, but they are beautifully packaged, required some capital investment, so you have to wonder what the intended market is? Are there that many cineaste expats in town? Or are the Nepalis serious film buffs? The composer Walter Zimmermann has just turned 60. For many younger composers — wayward North Americans (like myself) in particular — Walter has been an essential and nuturing presence. I know of no other composer in this country who has, on the one hand, been so generous with their time and resources and, on the other, so uncompromising and impatient with any effort — whether his own, or that of a colleague — that was less than complete or lacked commitment to the essence or core of a musical idea. In his own music, Walter has no fear of handling hard topics and his Lokale Musik project, in particular, showed a path out, if not a solution, to making a traditional music (and perhaps even the historically troubled landscape around that music) into something new and transcendent. Walter is a fine composition teacher and has a special gift for stepping into a moribund scene and making it more lively with his enthusiasms and challenges. In a country where most artists are content to roll along with the restrictions of institutions and habit, Walter has been a champion of self-reliance and has never been content to do things in the default fashion. (One of my favorite examples was when he adjourned a scheduled "chalk talk" in Darmstadt for an outing to an rustic Inn on an Odenwald hilltop; he and the late Stefan Schaedler, as independent producers, were responsible for the last major Cage festival assembled with the composer's cooperation in Frankfurt, Anarchic Harmony, and, of course, Zimmermann's self-published anthology of interviews with experimental American composers, Desert Plants, was a decisive influence on many of us). I am very lucky to call Walter a friend and mentor and my debts to him, both material and ideal, are immense. (I recently made a small set of pieces facile, called Some Handywork, for piano with limited ambitus for Walter Zimmermann's 60th; the Bransle above recalls our mutual delight in AGON and the music of social dances). All that said, I appreciate the quiet and kindness of all the people I've encountered here. (Even theauto horns, though used frequently, are at least 30 db quieter than those in Germany). The residents of Kathmandu all seem to have a highly advanced sense of proprioception as they manage to negotiate their bodies through streets filled with every kind of transport medium. My children are having a grand time, even sharing a river bath with elephants. And I've learned to cook momos, the local version of the stuffed dumpling. When I'm back next week, I may even have something to write about music. This story makes me very happy: Newspeak and Ensemble de Sade are holding their "1st Annual New Music Bake Sale". It's not quite the pancake breakfast suggested here, but it'll certainly do. In order to thrive, New Music has to go wide and deep, not only concentrating on the elite institutional life of opera houses, major orchestras, university music departments and a handful of venues in Manhattan, but reaching and integrating our music-making into homes, schools, and communities, a task not made any easier by the increasingly disconnected patterns of contemporary life. I can't make it on the 17th — I'll be with the family in Nepal — but if you do, have a slice of banana bread and think of me. Reduction in cooking eliminates bulk and intensifies taste. The equivalent move in the radical music*, the reduction of materials to a minimum serves a similar function. I'll repeat, again, the most useful definition of minimalism: "the elimination of distraction" but add this: the intensification of the experience of sound. In these very famous pieces, the right hand is busy with only five notes at a time in a piece or section of a piece, one for each finger. The left hand sometimes gets to play with a few more than five. With so few tones available, and each tone consequently subject to frequent iteration, we should be able to settle quickly into a comfortably familar neighborhood of the tones used singly, in sucession or in combination . But the composer always manages to surprise, bringing out unexpected depth in what would initially appear to be a rather shallow field of possibilities. The chord above to which the forefinger is pointing is a case in point. Yes, this is music about exquisite — and, sometimes, exquisitely familiar if not banal — voice leading, and habits of voice leading should excuse the b in the left hand as a neighboring tone, just passing by, but we do also hear this coincidence of lines as a chord, in its context, and as a very special chord indeed, perhaps the most sonically dissonant possible assembly of three tones extractable from this collection. Such clear means, such reduced materials, and yet such a complex sensation, at the limits of our tonal sensibilities, conditioned as they are by musical experience and probably some neurological hard-wiring. Okay, this is not The Famous Minimalism, and there are other things going on, especially in the realm of metre and accent, but the impulse is the same: simmer, reduce, and the materials are given a new context or frame, one in which we can pay attention to details that would otherwise get (dis)missed. Or this: I've recently been playing through Charles Shere's sonata ii: compositio ut explicatio (related to a lecture by Gertrude Stein, Composition as Explanation and, in one version, playable as accompaniment to a rhythmicized performance of that lecture). This is a large-scale work for solo piano, about an hour in duration, with a particular wealth of variety in registration and texture. The generous scale of the work and the way in which similar figures and textures are almost rhetorically deployed over its course are so engaging that it scarcely registers that the piece only uses the white keys. * There is almost too much material in those seven pitch classes. Additional chromaticism, given the variety of gestures and textures, would probably be a distraction. Again, simmer, reduce until the flavor is more intense than the sum of the ingredients. *For more about the Radical Music, see this collection of posts, or these fragments of a manifesto. ** This is also a Stein reference, in that the writer liked to improvise on the white keys only. Virgil Thomson's Piano Sonata No. 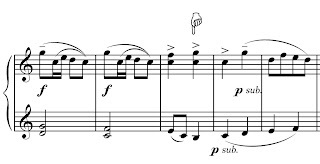 3, written for Stein, is also a white key piece. Another large-scale work for the white keys only is John Cage's Four Walls. These pieces would make a swell program (hint hint).